el enemigo común begins to describe the face of a common thread between different communities in resistance. In particular, the film draws specific correlations and differences between the effects of Free Trade on the daily lives of peasant farm-workers, and the nature of resistances from the front lines of a international humanitarian movement for social, political, and economic justice. COMPA, the Oaxacan Anti-neoliberal Popular Magonista Coordination, is an indigenous farm-worker’s rights group in Oaxaca, Mexico composed of over 300 communities around the state. 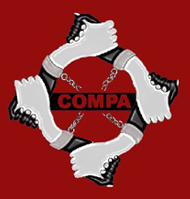 COMPA has been under constant attack by successive Institutional Revolutionary Party or P.R.I. governors determined to uproot an entire population. 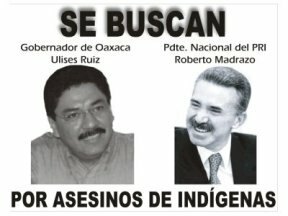 Most recently, Oaxacan Governor Ulises Ruiz Ortiz took office and outlawed most forms of political protest and freedom of press, detaining hundreds and murdering others. 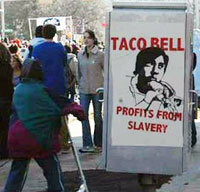 On March 8, after nearly four years of struggle and amidst the momentum of the 2005 Taco Bell Truth Tour, farmworkers from the Coalition of Immokalee Workers (CIW) scored a decisive victory in their national boycott of Taco Bell. 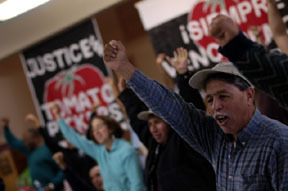 Caving under the weight of an intense grassroots campaign, the fast-food giant has agreed to work with the Florida-based farmworker organization to improve the wages and working conditions of farmworkers in the Florida tomato industry by paying a penny-per-pound surcharge demanded by the workers. The farmworkers’ sub-poverty wages have been stagnant and declining in real terms since 1978. FRESNO, CA (8/4/02) — Indigenous people from Oaxaca have been migrating within Mexico, and to the US, for decades. Many were braceros during that program’s 22-year run from 1942 to 1964. In Mexican agricultural valleys from Sinaloa to Baja California, Oaxacan migrants are the backbone of the labor force which made corporate agriculture possible. As a result, communities of Oaxacans have settled in a broad swath leading from their state of origin, through Veracruz, where they went first as the labor force in the sugar harvest, through northwest Mexico’s fields of tomatoes and strawberries, into the valleys of California’s San Joaquin and Oregon’s Wilamette Rivers, and to Washington state, Florida and beyond.